The other day one of my sweet students was in tears. I pulled her aside to figure out what was going on. She was having an argument with a friend. Both of these students are well behaved wonderful young ladies. She shared with me that she misunderstood her friend so she said something hurtful to her. She had apologized to her but she felt really bad that she had hurt her feelings. My heart swelled with joy as she shared with me. I was so proud of her! First of all, she owned her mistake. She admitted that what she said was wrong. That’s HUGE! Then she apologized for her mistake. WOW! I told her that, as humans, we all make mistakes. We all have conflict with people from time to time. But when we have conflict, it is important to have wisdom in how we handle it. This student used wisdom. She chose to own her mistake and apologize for it. I have been in that situation many times. I have said and done hurtful things, and sadly, often to the people I care about the most. My temper can get the best of me, and my tongue takes me down faster than anything else. Conflict is inevitable in every relationship. In fact, the closer we are to people, the more likely that disagreements will arise. As humans, we are fallible. We make mistakes. No one is perfect–aside from our Lord Jesus Christ. We put unrealistic expectations on others to constantly maintain a certain level of perfection, and they can’t do it–and neither can we. I have learned that conflict can actually be an opportunity to bond people closer together. It takes honesty and humility. It’s being able to let go of pride and say “I’m sorry.” It’s having the ability to forgive, let go, and move forward in the relationship. And that is exactly what God wants us to do! Great friends are great forgivers. Our God is a God of reconciliation. Isn’t that the whole story of the Bible? Adam and Eve lived in a perfect world. They walked in close fellowship with their Creator. But all that changed when they disobeyed God. Their bond and close relationship with God was broken–and so was ours. But after that, God set His magnificent plan in motion and stopped at nothing to redeem and reconcile His children back to Himself. There was not a price too high that He was not willing to pay. In fact, He paid the ultimate price with the blood and sacrifice of His One and Only perfect Son. All that–just to have a relationship with us! Wow! And God wants us to imitate Him in our relationships with others. The Lord is calling us to be people of reconciliation. The conflict that Satan might be using to try and divide our relationships, could be the very thing that God wants to use to bond us closer together than ever before. Reconciliation is hard, but it is beautiful! There is nothing more special or precious than when God renews and restores broken relationships. It’s His specialty. It’s what He does best! We just have to let Him. And we have to obey His Word and do our part to love and forgive. 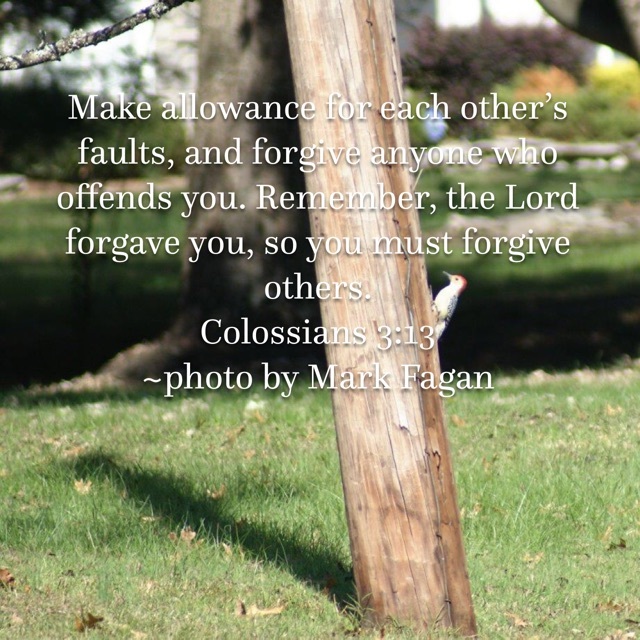 Lately, I have been reflecting on how thankful I am for the precious people God has placed in my life who have chosen to forgive me and “make allowances” for all my faults. What beautiful reflections they are of the Lord! I have experienced that grace and forgiveness in my life time and time again–from friends, family, and the Lord. What a treasure that is! Nothing is more precious! I am so convicted by my own words today. Sadly, I do not always live what I preach. I have a long way to go in this area. But I want to do better. I also realize that I can’t do it on my own. None of us can. We have to have God’s help. Reconciliation begins on our knees. Beautifully said & so true. Thank you so much for this great reminder. Thank you so much! You are so encouraging. 🙂 I am enjoying your quotes too. Keep them coming!